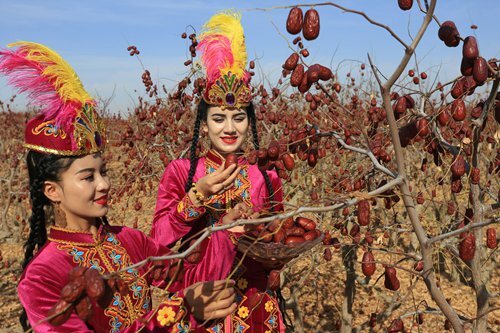 A dry, rainless desert is a nightmare for most farmers, but adequate light and heat that come with it is a blessing for potato growers, as Zhu Hexiang has witnessed. Zhu is an official at the commerce department of Xinjiang Uyghur Autonomous Region. A year ago, she was tasked with assisting the poverty alleviation work in a village under Yopurga County, some 1,500 km away from the regional capital of Urumqi. Yopurga is located at the western edge of the Taklimakan, the largest desert in China, where local farmers used to grow wheat, cotton and dates. When Zhu first arrived, 269 out of 1,054 villagers were from registered low-income families. The local government developed a plan to lift the whole village out of poverty by 2019. After some research, Zhu proposed planting 34.9 hectares of potatoes along with two neighboring poverty-stricken villages. They harvested more than 1,300 tons of potatoes in the first year. But Zhu went even further. In addition to promoting the online sale of potatoes, she contacted logistics companies, supermarkets and wholesale markets to open up new sales channels. Thanks to those efforts, additional income of 45,000 yuan ($6,500) was generated for each hectare of land. As winter came, Zhu led villagers to grow celery and cabbage in the potato fields, which was very popular at local markets. Punjabahti Mehmet's cabbage sold like hot cakes in nearby towns. He had also earned 14,000 yuan growing potatoes in the past year, several times the income he earned in previous years. "We don't have to worry about sales of farm products anymore. Everyone in the village is more enthusiastic than ever doing farm work," he said. Rahman Nasr, like many of his fellow villagers, migrated to work in other towns almost all year. But as he could not speak fluent Putonghua, he worked as a casual laborer most of the time. "Poverty causes for each household vary, so, I must draw detailed measures to help them practically based on their individual situations," Zhu said. She invited experts from her department to host training classes in the village such as cooking and domestic cleaning. More than 100 villagers have mastered practical skills through training. They also attended night school to practice Putonghua. Rahman, for example, found a job of stretching noodles at a restaurant in the county using what he learned from a class. The noodles he pulled were even and chewy and he received good feedback from customers. He also communicated with customers with better Putonghua. Winter is usually a low season in the village, but not for Zhu. She has huge ambition for the coming new year. She said farming should be further cultivated to bring more income for villagers, planting crops and farm products processing should be enhanced and e-commerce should be introduced to create more jobs.